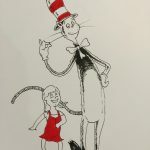 On her 3rd Birthday, Cami was really into the Cat and the Hat, so I did my best version of the Seuss superstar. 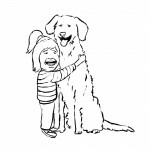 Here’s another drawing I did for the birthday of one of my daughter’s playmates. 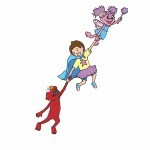 This one was for Hannah who was really into Elmo and Abby from Sesame Street when her 2nd birthday came around. As previously mentioned, I have been doing little drawings for the birthdays of my daughter’s playmates. 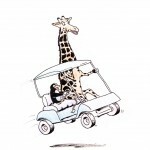 This one was for Cami who was way into penguins, giraffes, and golf carts on her 2nd birthday.